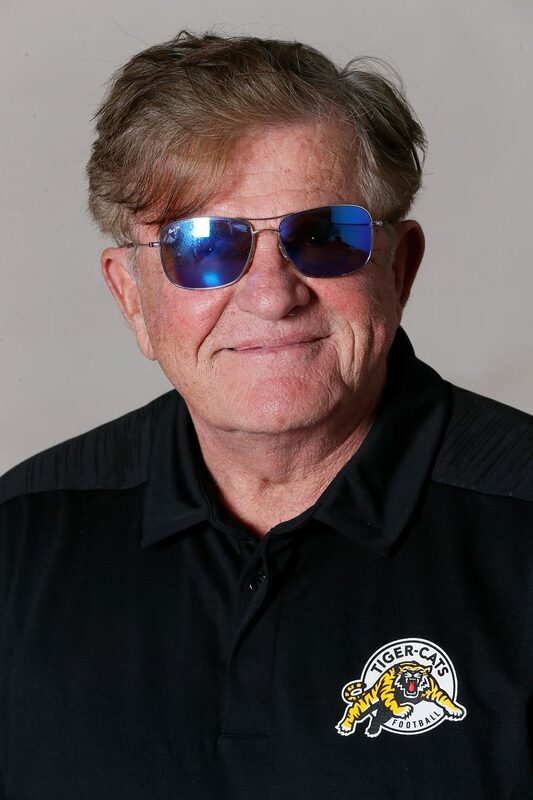 Jerry Glanville was appointed Defensive Coordinator of the Hamilton Tiger-Cats February 23, 2018. In his first season with the Ticats in 2018, Glanville led a defence that allowed the fewest rushing yards against per game in the second half of the season (76.7), first downs (332) and passing first downs (186), the second-fewest rushing first downs (108), and the third-fewest rush attempts per game (19.1) and passing yards per game (247.7) in the CFL. The Tiger-Cats’ defence also sported several all-stars, including CFL All-Stars linebacker Don Unamba and defensive back Delvin Breaux Sr. and East Division All-Stars Unamba, Breaux Sr., defensive tackle Ted Laurent, linebacker Larry Dean and defensive back Cariel Brooks. Additionally, Dean was named the East Division’s most outstanding defensive player as he became the fourth player in team history to record 100 defensive tackles in a season. Glanville, who also spent the 2017 training camp with the Tiger-Cats and has vast experience in the coaching ranks spanning more than 30 years, has consistently produced excellent defensive football throughout his career. He has served as a head coach for over 12 years, including stints in the National Football League with the Houston Oilers (1985-89) and the Atlanta Falcons (1990-93), and in the NCAA at Portland State University (2007-09). Glanville has also served as a defensive coordinator for numerous teams, including in the NFL with Atlanta (1979-82) and Houston (1985-89), and with the NCAA’s Western Kentucky University (1967) and University of Hawaii (2005-06). His resume includes coaching in nine NFL playoff games, two Senior Bowls, four East-West Shrine games, the Texas vs. The Nation All-Star Game, and multiple NCAA bowl games, including the Liberty Bowl, Sun Bowl, Peach Bowl and Hawaii Bowl. Glanville and Tiger-Cats’ Head Coach June Jones have coached together multiple times at both the NFL and NCAA levels, including Houston (1987-88), Atlanta (1991-93), at the University of Hawaii (2005-06), the 2011 Texas vs. The Nation All-Star Game and most recently at the East-West Shrine games in 2014 and 2016. He was also on the coaching staff for the Falcons during Jones’ entire five-year playing career in the NFL from 1977 to 1981. The native of Perrysburg, Ohio, began his coaching career at Western Kentucky University in 1967, shortly after his own career as a player had ended. After one season as associate head coach and defensive coordinator with the Hilltoppers, he served as the defensive ends and linebackers coach at Georgia Tech from 1968 to 1973. Glanville’s NFL career began as a special teams and linebackers coach with the Detroit Lions from 1974 to 1976. He joined the Falcons in 1977 as a defensive backs coach and then served as defensive coordinator (1979-82), and was responsible for Atlanta’s dogged defence, nicknamed the “Grits Blitz.” Glanville had a one-year stint with the Buffalo Bills as a defensive backs coach in 1983 and then joined the Oilers in 1984 as defensive coordinator, becoming their head coach in 1986. He turned the Houston Astrodome into “The House of Pain”, remaining head coach until 1989 and leading his team to the playoffs for three consecutive years. Glanville’s success in Houston brought him back to Atlanta in 1990, this time as head coach. In 1991, the Falcons had a 10-6 record, their rush defence went from last to first and allowed no rushing touchdowns in a stretch of seven consecutive games, the defence as a unit had 35 takeaways, while their cornerbacks led the NFL in interceptions and had the lowest opponent completion percentage allowed in the NFL. During his tenure as head coach in Atlanta, he coached talented players such as future Hall of Famer cornerback “Prime Time” Deion Sanders and perennial All-Pro linebacker Jessie Tuggle. Glanville was out of coaching from 1994 to 2004, but continued to be an outspoken, insightful and entertaining voice of the game as an analyst for HBO’s “Inside the NFL”, CBS’s “The NFL Today” and Fox’s coverage of the NFL. During that span, Glanville, an avid motor-sports fan and participant, also raced in multiple NASCAR series from 1992 to 1999, including the Busch Grand National, SuperTruck and Winston West. He also raced in the ARCA Series and drag races in the NHRA and NMRA until 2004. After two years as defensive coordinator at the University of Hawaii (2005-06), Glanville was named the head coach at Portland State University in 2007, his first college head coaching job. He was the program’s 12th head coach in their history and remained at Portland State until 2009. In 2011, the Hartford Colonials of the United Football League announced that Glanville would serve as the team’s head coach and general manager. The Colonials suspended operations in August of that year but Glanville would remain with the league as a consultant, color commentator for the league’s television broadcasts, and liaison for potential expansion markets. A graduate of Northern Michigan University, where he played linebacker on the football team from 1961 to 1964, Glanville was inducted into the Northern Michigan University Hall of Fame in 1992 and is a recipient of the Distinguished Alumni Award. He later received a master’s degree from Western Kentucky University in 1968.